When I start painting a new portrait of someone, I’m never sure how long it will take me. It might be finished in one hour, or I might be working on the same painting during several sessions. Last weekend, I wanted to paint a portrait ‘from life’, but I didn’t want to ask my girlfriend to sit still for hours and hours. Actually, I didn’t want to disturb my girlfriend at all, because she was blogging quite serious on her laptop. That’s when I thought: why not paint her just like this? Why should people always sit or stand in traditional positions when they have their portrait painted? The composition will not necessarily be original, and what does a classical body posture say about the time we’re living in right now? I think it’s good and challenging to experiment with the body posture of your model. This experimental approach, is one of the reasons why I like a contemporary painter like Michaël Borremans. Below, you’ll find the portrait of my blogging girlfriend. 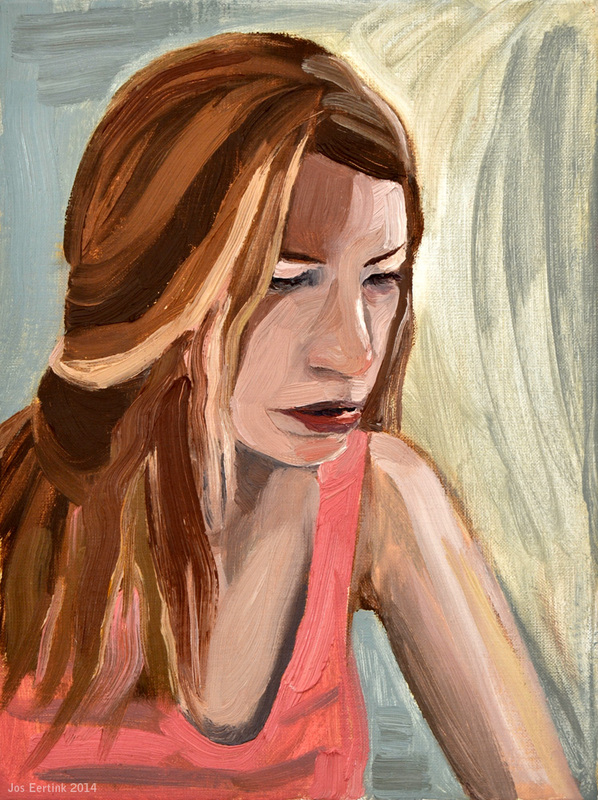 Or as she suggested as a title: ‘Painting of a devoted blogger’.